Written by V.S. 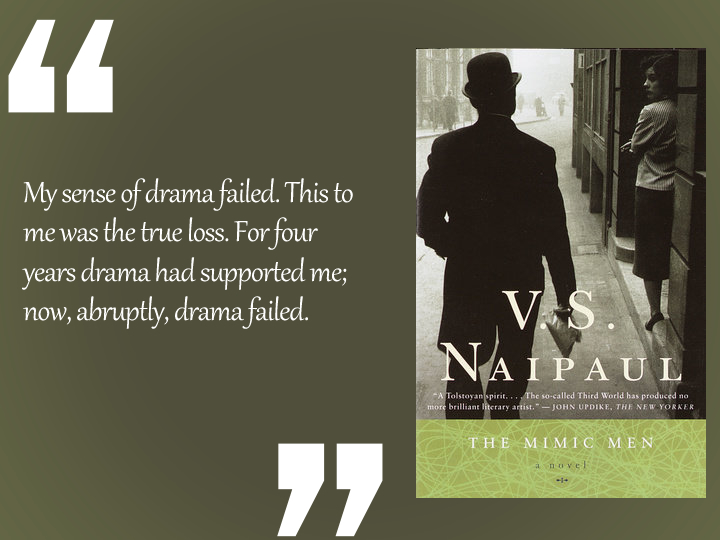 Naipaul and published in 1967, The Mimic Men is about the life of Ralph Singh, a disgraced minister in exile in London. Sitting and writing his memoir in a boardinghouse, Ralph Singh allows us to get to know his life as a child on the island of Isabella, his life as a student in London and his political career back home. By presenting different times, places and situations, Singh tries to complete the puzzle of his life. He deals with the notion of colonization, decolonization, alienation, history, culture, politics and corruption to write and understand his own life which is characterized by disorder and chaos. My first memory of school is of taking an apple to the teacher. This puzzles me. We had no apples on Isabella. 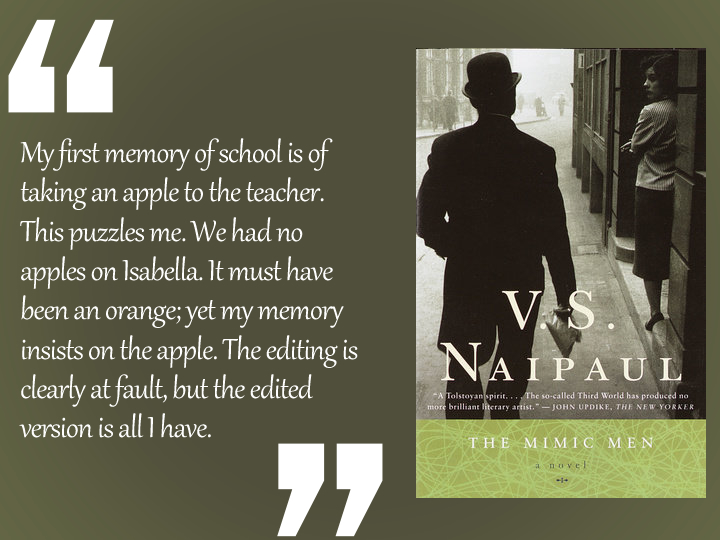 It must have been an orange; yet my memory insists on the apple. The editing is clearly at fault, but the edited version is all I have. The commonest type of political ambition is the desire for eviction and succession. But the order to which the colonial politician succeeds is not his order. It is something he is compelled to destroy; destruction comes with his emergence and is a condition of his power. We were a haphazard, disordered and mixed society in which there could be nothing like damaging exclusion. Shipwreck: I have used this word before. With my island background, it was the word that always came to me. And this was what I felt I had encountered again in the great city: this feeling of being adrift, a cell in preparation, little more, that might be altered, if only fleetingly, by any encounter. I no longer yearn for ideal landscapes and no longer wish to know the god of the city. This does not strike me as a loss. I feel, instead, I have lived through attachment and freed myself from one cycle of events. It gives me joy to find that in so doing I have also fulfilled the fourfold division of life prescribed by our Aryan ancestors. I have been student, householder and man of affairs, recluse. We began in bluff. We continued in bluff. But there was a difference. We began in innocence, believing in the virtue of the smell of sweat. We continued with knowledge, of poverty and power. We, here on our island, handling books printed in this world, and using its goods, had been abandoned and forgotten. We pretended to be real, to be learning, to be preparing ourselves for life, we mimic men of the New World, one unknown corner of it, with all its reminders of the corruption that came so quickly to the new. We were among men who felt more cheated, more bitter in their power than they had ever done before, men who feared that the rich world so wonderfully open to them might at any moment be withdrawn. My sense of drama failed. This to me was the true loss. For four years drama had supported me; now, abruptly, drama failed.